April 6, 2015 April 7, 2015 - by Shirley Tian - 4 Comments. 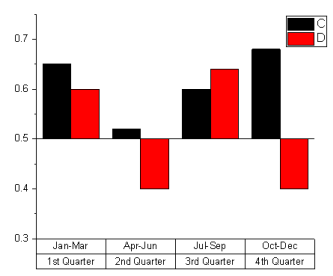 By default, when you plot a column graph, the column bar will start from Y=0. 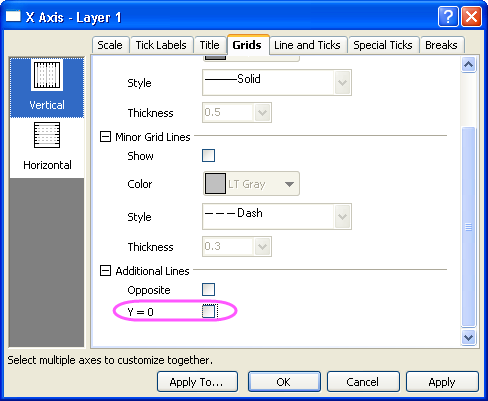 This is controlled by Y=0 checkbox on Grids tab of Axis dialog when Vertical is selected on left panel. If Y=0 isn’t checked, Column will always start from bottom axis position. 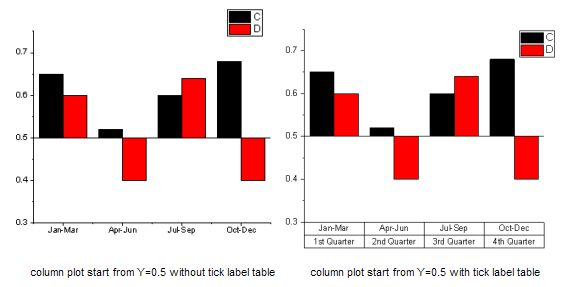 Sometimes user wants the column/bar plot to start from a non-zero baseline which is not the bottom of the axis, we can implement this by moving the bottom axis position, If user still wants tick labels at the bottom of the graph, then user can turn top axis on and put it at the bottom of graph. E.g. the following example will show you how to plot a column plot starting from Y=0.5 position. 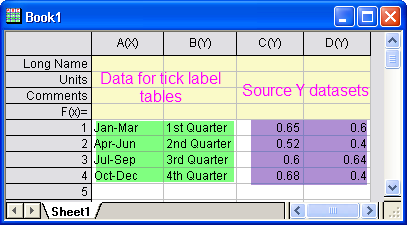 In the attached OPJ file, there is one worksheet with 4 columns, the first two columns, (col(A), col(B)) are data for tick label tables, and the last two columns are source Y datasets. In the following steps, we are going to turn on two horizontal axes: the Top X axis and the Bottom X axis. 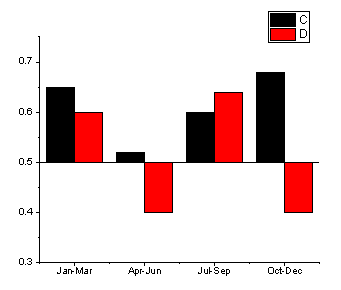 Then move the bottom axis to Y=0.5 as baseline of the columns, and move the top axis to the bottom. With the workbook Book1 active, highlight col(C) and col(D) to select Plot: Column/Bar/Pie: Column to plot a column graph. 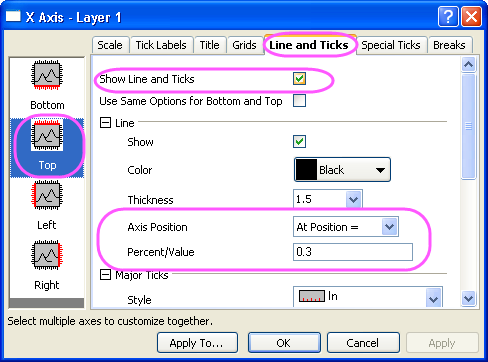 Double click Y axis line to open the Axis dialog. On Scale tab and Set From to 0.3. Go to Grids tab. Select Vertical icon on the left panel. Clear Y=0 checkbox. Go to the Line and Ticks tab, with the Bottom icon selected, set Axis Position as At Position= and enter 0.5 in the Percent/Value text box. Set the Style of Major Ticks and Minor Ticks as None. 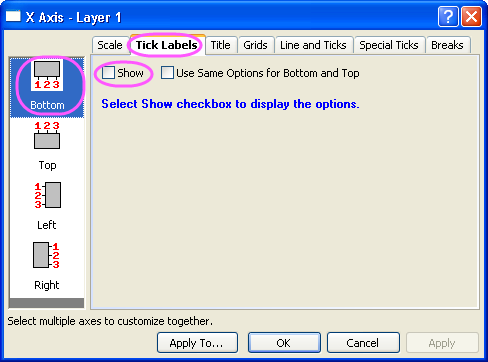 Go to Tick Labels and Title tabs, with Bottom icon selected, uncheck the Show check box. Click Apply button. Now we have the bottom axis start from Y=0.5 in the Graph. In the following steps, we are going to move the top axis to the bottom of graph. Select Top icon in the left panel, choose the Show check box. Then choose the Format tab, enter -200 in the Vertical text box under the Offset in %Point Size branch. Choose the Line and Ticks tab, with the Top icon selected, select Show Line and Ticks check box. 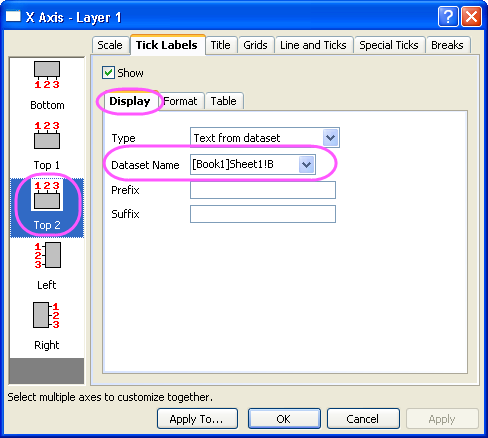 set Axis Position as At Position= and enter 0.3 in the Percent/Value text box. You can also set the Axis Position to be % From Top, and enter Percent/Value as -100 to achieve the same thing. Then you will get the below graph. 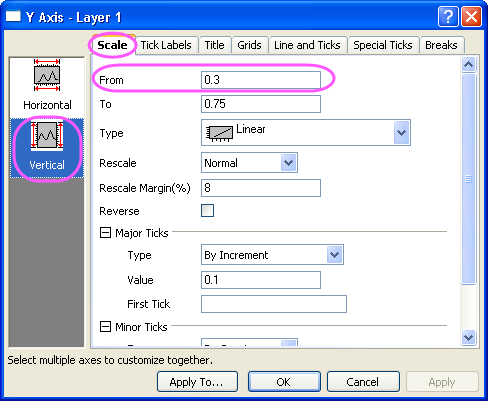 Double click the tick labels at the bottom of the graph to open the Axis dialog. Remember the axis at that the bottom of the graph is actually Top axis. So make sure Top icon is selected on the left panel. Go to Tick Labels tab. 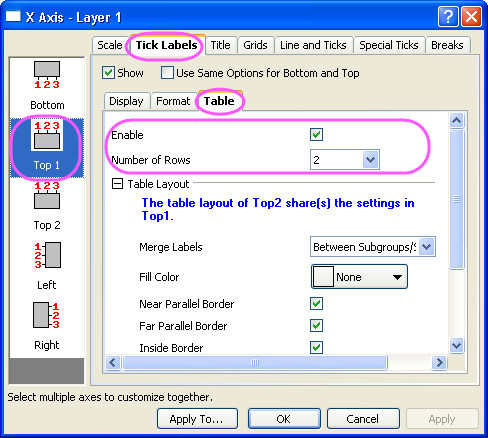 Select 2nd level Table tab. Check Enable checkbox. And set Number of Rows to be 2. Top 1 and Top 2 icons will show on left panel. Click the OK button. 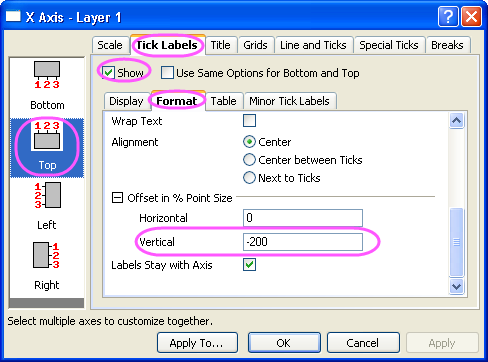 Tick label table will show at the bottom of the graph. It starts upwards from bottom axis line. Click on any grids in the table to select the table and drag it down so that the top of the table meets Y=0.3 line.You will get the graph below. Previous Article Speed Mode – How does it affect my graph and its exported image? what is the Minimum Origin Version Required for this example？I am using originpro 9.1, however i can not get this done. Origin 9.1’s Axis dialog is very hard to use. We recommend you to upgrade to later versions. In Origin 9.1, u can still plot column/bars from non-zero baseline. 1. 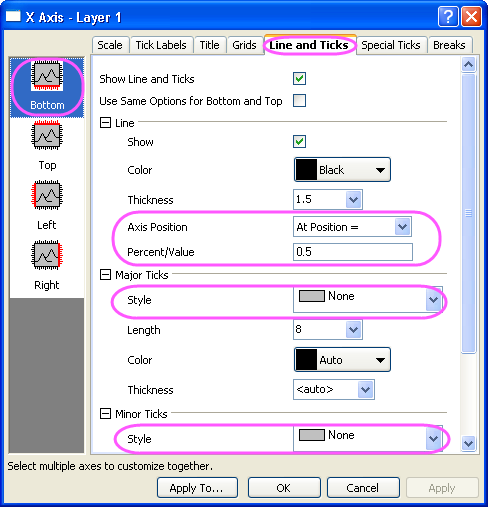 Double click X axis to open Axid dialog. 2. Go to X Axis-> Grids tab and uncheck Y=0 so it will start from the bottom of y axis. 3. Go to X Axis -> Line and Ticks -> Bottom node. Set Axis Position to At Position = and enter the value you want the column/bar to start from. 4. If you still want an X axis showing at the bottom. Still in the dialog, click X Axis on the left panel/. Check Show Top Axis. Then go to X Axis -> Line and Ticks -> Top. Set Axis Position At Position= and enter 0. You can drag the tick labels to expected position. This is a bug and there isn’t a good solution yet. Anyway, I have reported it(ORG-14106) and suppose it will be fixed in upcoming 2016 SR1.